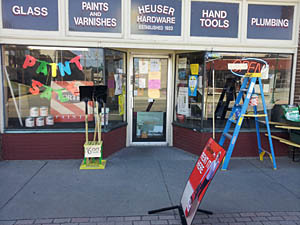 Congratulations to Heuser Hardware, celebrating 90 years in business this week! James R. Heuser started the business in 1923 on 8th and Spring Streets, and moved to their current location at 523 Spring Street in 1930 where they remain. They’ve survived everything from the 1937 flood to the onslaught of the big box retailers. Thomas Densford, his twin brother Bill Densford and Larry Rogers are currently the owners of the business and they’d like to invite everyone to join them this Saturday June 29th from 11am to 1pm for giveaways, food, and birthday cake as a special thank you to their Southern Indiana customers for their patronage over the past 90 years. Here’s to another 90 years of success!